Who could down play this effort, even if the subject matter does not fit ones taste. 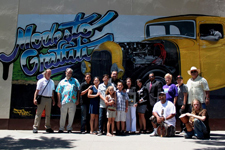 Celebrating Classic Modesto USA and our American Graffiti heritage, hometown heroes and classic town feeling with "Community Created" art murals for all. 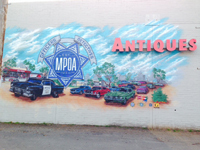 Modesto USA is known around the world for our rich history showcased by our American Graffiti heritage. 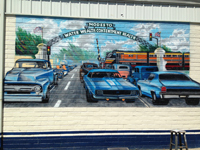 Visitors and locals alike find the classic cars, the rock and roll, the cruising and the hometown hero legends fascinating. 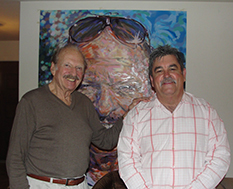 Peer Recovery Art Gallery, ModestoView and founding artist FASM Aaron Vickery and Tom Nye welcome the entire "Community" to get involved, create, and celebrate. Aaron "Fasm" Vickery | As a young adult, I worked in local sign shops learning the graphics platforms and other valuable concepts I would later build on and utilize in my work as a graphic artist. I also worked as a cartographer and spent years as a freelance artist using graphics programs prior to my hire at 5.11 in 2006. Every day I seek to learn more. I’ve picked up various tools including video editing, packaging design, 3D, etc. Graffiti art is a huge part of who I am. Although I didn’t start out practicing it in a productive way, I would be considered by some a pioneer of authentic legal graffiti. My craft has led me to travels throughout the states, painting commissioned murals including a video project with Billy Graham Evangelistic Association in North Carolina. Recently I was commissioned to paint and install a 72’ mural for a corporate summit at Facebook HQ which hosted a group of the nation's top marketing executives and keynote speaker, Tony Hawk. I thank God for the friends and family I have and strive to be more concerned about others and less about myself. I continue to work at this and look for opportunities to surround myself with art and artistic people. 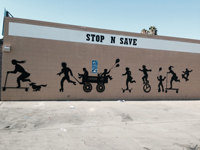 Tom Nye | Tom Nye is a founding member of Classic Community Murals. Tom Nye is an artist brought forth from the daze of Rat Fink, Big Daddy Ed Roth and Custom Hot Rod car madness. 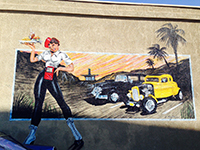 His high ability as an artist and his un compromised style with an Air brush made Tom Nye a wise choice to carry out the traditional nostalgia of the American Cruise as depicted in his works. 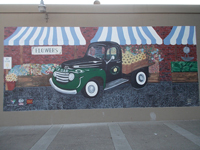 Eleanor "Ella" Yates | Eleanor (Ella) Yates has over 100 murals in churches, schools and urban streets around the world. She also leads community murals and icon painting workshops. 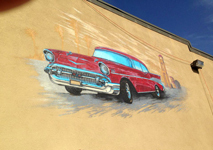 Local artist James Devlin proved invaluable on this mural team as well. 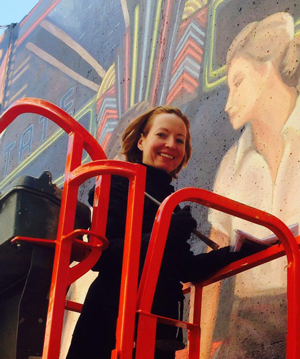 "I believe in murals because they brighten the world, create sacred space and tell important stories but also because the mural journey inspires discussion and friendship where stronger, more compassionate communities can flourish." 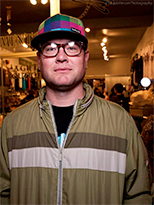 James Prigoff is an author, photographer and lecturer on the subject of worldwide urban murals. He is one of the most important photographers of aerosol art on the international scene. 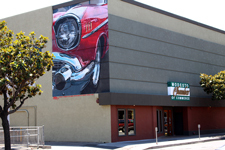 He started worldwide documentation of murals in the late 1960's. His interest would eventually lead him to aerosol art (graffiti). 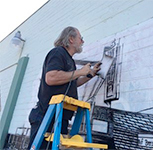 His personal photographs comprise one of the most extensive collections of aerosol art in the world. During the late 1970s and the early 1980s, Prigoff documented many aerosol art movements (from their infancy) across the United States and abroad. Important photographs from his collection appear in the book Spraycan Art published by Thames and Hudson in 1987, which he co-authored with photographer Henry Chalfant. This book would join the ranks of the films Wild Style and Style Wars and the book Subway Art in triggering the birth of additional aerosol art movements throughout the world. 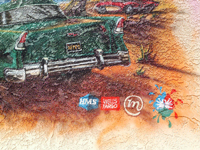 Prigoff is widely respected within the international aerosol art community. He developed close relationships with many writers enabling him to gain a perspective usually unobtainable to people outside the aerosol art community. 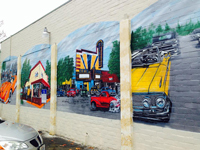 There's always new mural updates... So exciting... Stay tuned. 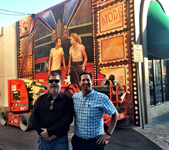 Modesto is going to be a destination for great public art!